A simple life where I'm grateful for the little things and see beauty in the mundane. That is all that I want and need. Such a profound post Rhonda, I am so very sorry about your dear friend. And honestly? I aspire to be like *you* - living a simple and honest life - I don't really think that (for me, at least) there *is* any other way to be happy. Thank you for your shining example. I feel for you as you are going through these days with your friend, Bernadette. What I strive for in my life? Peace in my family and in myself. Growing in my creativity. Being a loyal friend and family member. Making choices in how I treat the earth, animals and other people that I will not regret. I've taken myself out of the 'career path' several years ago, to concentrate on these important things. It's important to know what I value in life...especially during times of financial uncertainty. I had to run out to a dental appointment yesterday ... and as I was driving down our country lane, it dawned on me that I couldn't recall the last time I got away from our home :) This made me happy to think that staying and puttering at home is so worthwhile! Rhonda, you are so special! I truly hope you get the opportunity to have some more moments with your dear friend Bernadette,and when it is time to say goodbye, cherish every bit of the beautiful friendship that you two share. Hold it in your heart and take a moment each day to go there and sit in peace with the beautiful memories that you will have. My thoughts are very much with you at this difficult time. For what it is worth a very big hug to all of you from Cyprus. I know exactly how you feel. Since I have been dealing with my own cancer, every friend or family I lose reminds me to live very intentionally. Which I choose to by living simple. Thanks for a rundown of your plans today. I was intrigued about the soap. You mentioned that you had an easy recipe. Is it really that easy? I've never made soap before, but I would LOVE to learn because it seems like it would be better for my skin!!! There are a couple of natural brands that I buy in the store. The rest I ignore because there's something in most soaps that doesn't agree with my skin. You asked what makes us happy? What would we like to do? Well, let's see...Jesus makes me happy :) That's a given. I also love anything Victorian, romantic, country, frilly, pink or red, rusting, vintage etc. I love Anne of Green Gables...books and movies as well as the tv series, Road to Avonlea. I really enjoy crafts and homemade things. There's something about that that reminds me of a time when homemade things was more of a norm...a beautiful age. In fact, anything from the 1940s or earlier makes me happy. There's lots of little things..knitting, my dad buying me a fancy coffee drink etc. OH, one of my prized treasuerd is a copy of Weldon's Practical Needlework. Volume 4...which was a yearly publication comprising all the small booklets that were published that year. Mine is a reprint, but I love the old patterns :):) I think that particular issue was published sometime in the late 1800s. I'll have to go check my chart again. Oh, I enjoyed this post Rhonda...and I especially relate 100% to your last paragraph. I live simply. I don't need to live richly or famously. I love being home, quiet and peaceful (although with three small children...this season of my life is anything but quiet! ;) But I am happy and content and do truly feel sorry for those who feel they have to always struggling to want *more*....more money, more popularity, more stuff. Thank you for your words. I find them encouraging and lovely! Sounds like a productive and rewarding day ahead, Rhonda. Looking forward to seeing your RICOTTA and hearing about what is involved in producing that. Orange cake - sounds lovely! Thinking of your friend Bernadette, too. These things are especially hard, but your friendship towards her will be much appreciated, by both her and her other close supports. I simply shall say, I enjoy every comment you make, lessons you present in cooking, soaping, etc. Thank you so much for sharing. I am a stay at home wife, mother, grandmother and I love every minute of my life...(smile). I am a person who can't sit still. from milking cows at 4:30am to knitting while listening to my husband play guitar at night, fingers are always busy. It would seem I know no other way. But I too would not trade the business and homemade for anything. It's funny you mentioned making soap. I'm out of liquid hand soap and was wondering if I could make my own. I'd like to make my own soap for the shower too. Any recipes to share?? Rhonda, I have spent the past several weeks slowly going from 2007 forward into your blog. Of course, I also have you on RSS feed, so I'm getting the most recent, too. But until that day, this moment is a very special place indeed. The older I get the more aware I am of that fact. It is obvious to us all that you are a good wife, mother, and friend and that everyone in your life feels that. Heck, I even feel that here in Texas! Sharing your life has made me smile many, many times since I found your blog. Your wonderful husband and sons, your friends, your family, your dogs, cat, and "chooks" have all become part of my life, too. Thank you for being you. 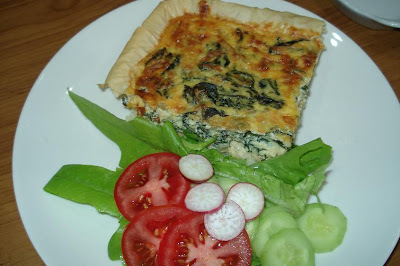 A lovely, reflective post that has inspired me to also do some cooking today. We have a lot of passionfruit so I'm thinking a tart and a sponge with passionfruit icing. What makes me happy? The fact that I don't have to leave my home and work at a full time job for someone else. I am very thankful for that and I don't take it for granted. In an earlier post, you spoke of my job being to create a loving, welcoming and safe environment for my family; of being thrifty and responsible with finances and of creating nourishing food created with love. I love my job and give of myself with each thing I do. My thoughts are with you during this time of impending loss. I love my simple, little life. growing fresh food, putting it up for meals during our cold winters. Figuring out how to make or fix something with things we already have or as cheaply as possible. Cleaning our home to present a calm, loving environment to my family. Reading books and sipping lemonade (or an ice cold beer)! A trip to Las Vegas or San Francisco to visit family once in a while! lol It doesn't take much to please me and I am always most happy and content at home. I think it is important to challenge ourselves daily to learn something or think outside the box to solve a problem. Live each day to the fullest! Lovley post-- warmest care where your friend is concerned. Mostly in my life happiness comes when I am home doing what I feel my place is to do. I love being simple and thanks to blogs like yours I have learned to be more appreciated of what I have I no longer want what others have. PLain or simple is all I need and of course my family. Rhonda, my thoughts to you and Bernadette at this time. You are so right, live the moment, not one of us know when it will be our last. What do I strive for you ask? As a studying, volunteering, stay home mum, I strive to care for my family. Only yesterday I had a meeting with one of my children's teachers, support teacher and vice principal. My child has been assessed as being 'severe' in certain areas of his speech (receptive being severe and expressive he scored moderate). When my children were born, there was no handbook that come out with the placenta, on their 'how to' instructions. I loved them, I played with them, I taught them how to dress, speak, toilet train, cuddle, eat, clap hands, paint, ride their bikes, fly a kite, I cooked for them, I sewed and knitted for them. I still do all these things for them and wouldn't have it any other way. My little fellow is shy, he doesn't enjoy getting up in front of 23 other pairs of little eyes watching his every move and hearing his every word. I don't blame him, I am the same. There is just so much pressure on teaching staff, I feel, to meet stats, to tick the boxes, to have the children meet a certain criteria - it's chaos and total rush hour for the 6 hours of their school day. I know this, as I am a student in the classroom 1 day per week and the schedule is totally full on (Studying Teachers Aide). The classroom teacher for my son is an angel, sent from heaven, while discussing my son yesterday afternoon, I said to all 3 of the staff, that I felt, less is more for my little boy. She totally agreed with me and told me that is exactly spot on. She has been giving him smaller instructions, prompting him, giving him less, so as to not overwhelm him, and I so love her for it, because I know she has 23 other children to cater for and educate, plus meet the criteria set by the education department/government etc etc. Sorry for my long post, but it feels so good to get this off my chest. Less really IS more, not just for my darling little boy, but for everything we do and buy. There is a huge excitement running through some mum's I know because oh my goodness the toy sales are about to start. holy cow!! I never got into that whole pile of rubbish, and I hope I never do. Sure my children have toys, we have games, puzzles, the whole shebang, but not to the extent that some go. We basically just cannot afford it, and also, I hate that whole system of 'gotta have it all.' Not to mention the whole 'green' aspect and slave labor etc. ugg, I shudder. Bless you Rhonda, and to all you other women out there that strive for the good of your families. Thank you. Rhonda Jean...you DO have a rich life. It is rich in all that counts. What would make me happy is to be able to slow down and live MY life to the fullest. So far, I have not been able to do this as the bills keep piling up and I am having to work a full time job just to keep my nose above water. The one thing I can say though (and I am grateful for) is that I owe no one except the utility companies. One day I will have the utilities under control and I won't be owing them much! For now I am satisfied with what I am working toward. I am keeping my eye on the prize! Thanks for the simple message this morning, it was everything and more, and probably more than you expected to give someone you've never met. I too, enjoy being at home with my cherubs and doing things to make their home comfortable and easy to live in. I'm knitting too, but as I'm a bit of a newbie to patterning I'm tackling a scarf for my sister that is made from an age-old baby lace pattern that makes most people over 40 reminisce about watching their grandmothers do the same - making a home, knitting and making do - and it's such a nice feeling. I totally agree with your sentiments,Rhonda. The only things I really want is to be mortgage free, healthy kids and husband and a little bit if travel on the side.I still work fulltime but am at my happiest when I am just at home. 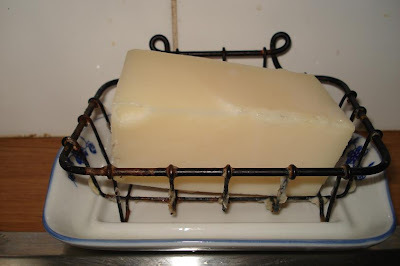 I do enjoy your blog so much and would love to know how to make my own soap as my husband suffers badly with dry skin in the winter as well. Rhonda, it sounds like you have your priorities right. For me, I strive to live within my value system, to honour God (though I think I forget this more often than not), to be a good parent raising a daughter to be well equipped for her own life, to be a good wife, and to find pleasure in the little things. I baked some incredibly yummy biscuits this morning, so I'm feeling like today's a good one even if I'm battling wills with my 18 month old and haven't done most of my other tasks for the day! This post really touched me Rhonda. The simplicity and comfort of home and the gentle rhythm of everyday life can be soothing at such times as these. Praying for Bernadette and for you. You pretty much summed up how I feel about life, and I really do try to live one day at a time, one moment at a time. Through difficult times I have come to lean on and rely completely on God and my sense of purpose in life and my peace and joy come from Him. Your blog is a constant source of learning for me, and a very enjoyable part of my day. while here on earth but I take great solace in knowing I will be reunited with them for all eternity and the pain of lose will not be remembered. pot of marinara sauce using veggies from our garden. Gone for 18 months . . . And now we can see them at a moments notice! What a joy to cuddle with our grandson and hug our children! I am so grateful and amazed to have them close by! plums, the smell of homemade bread, a hug or pat from my dear husband . . . It doesn't get much better than that! be learned, so many ways to share this beautiful live with others. We are truly blessed! important we treasure those dear to us and take the time to smell the roses, be awed by the sunsets, rainbows, sunny days and cloudy skies. Life is too short to waste. We must be extravagant in showing love. Rhonda, you are rich beyond measure! Thank you for your post today inspiring as ever. My thoughts are with you and your friend Bernadette. Thank you for sharing this today. I found out last night that my Grandma is seriously ill in hospital (she has had dementia for a while and now has bowel problems so there could be an unpleasant outcome). I don't know her well but I feel for my Mum who lives on the other side of the country from her. The last time she saw her (for her 80th last month) was a wonderful visit and time to make lasting memories. This was the last moment she will have with her. Feel blessed that you can see your friend so many times before her last day on earth. Dear Miss Rhonda, I'm so sorry about Bernadette. Though I haven't been commenting (it's summer here in Canada- along with gardening and canning), I have been stopping by every day to read and keep up. I wish I could give you a nice big hug, but a cyber hug will have to do. Bernadette couldn't ask for a better friend. And I think you have a very rich life! It's so sad- what people call riches now. When I read your blog, you seem to have a steady, content presence, which calms other people as well. That is something truly valuable. to be all that God wants me to be. To give the best I have to my job as a homemaker and steward of all I have here on earth. To provide a comfortable, joyful home where friendships, love, peace, and faith are higher on the list than the silly material things advertized on billboards and whatnot. To have higher standards for myself than for others. To have faith when doubts come. To love when someone who doesn't deserve it. To see beauty in the broken. To be a good example but not self-righteous. To forgive and not condemn. To change myself, not others. To smile instead of frown. To love in spite of faults, failures, hurt, and pain, because it's worth it. There is so much more...but you get the idea. Praying for you and Bernadette! I think you already live your life to the fullest each and every day. So you don't get a long to do list accomplished some times, that's okay. You are living your dream, you are making every moment of your precious life count, how many of us can truly say that. Keep hanging in there, you are doing great! Rhonda........I aspire to all the same things as you, and I add "peace" to the list. Just give me peace. Simple things are best. I love homemade ricotta, I can't even bring myself to buy it on a pinch now that I know how easy it is to make and how much better it tastes. However, I would love to make that soap. Later when I have time I will have a look around your blog for the recipe. Enjoy every minute with your friend, Bernadette. Those memories will give you something to hold onto later. Sounds so nice and peaceful actually. I'm still homeschooling and chasing around 2 growing up girls. Can't wait for the day when I can feel as relaxed as you. We learn and grow everyday I guess that comes with age and wisdom. Actual my to do list is shorter simple because of working outside of the home. But at this time it's working for me. Thinking of you as you take the last bitter sweet steps on your journey with your dear friend Bernadette. I'm so sorry about Bernadette. I can't imagine the difficulty in saying good-bye. Your words are a beautiful reminder of what is truly important in life - to make the most of it. What makes me happiest is being with my loved ones and moving toward continually simpler life. I look forward to the day when we can move out of town into the country and have a little land to raise chickens and possibly a cow or hog. The solitude and quiet of the country gives me great peace. You are absolutely right in your thinking Rhonda. In this modern life, we tend to go full bore and lose sight of the simple things. We need to take time out and think of the "blessings". Treasure what time you have left with Bernadette. The memories of your lovely friendship will be something that you can look back on, with deep fondness, in the future. Take care and my thoughts are with you. Rhonda, I think your life is exciting in a peaceful kind of way with all the things you do each day. Sending hugs to Bernadette and prayers for her pain to be as minimal as possible. Love your simple meals and would love to know if the pic is of a quiche of some kind? Looks delicious. I have been wondering how Bernadette was going. I have recently walked the same road, with my mother, who died at home with me last Friday. I hope Bernadette's time is peaceful, and that you can feel a sense of the sacred as you walk with her.